The Locals e-mailed me some time ago suggesting that their indie-rock and my literary-minded randomness would work well together. (Hey, thanks for reading the posts!) Plus, they’re from Chicago and I used to live there too. And they’ve got this thing for a Danger Boy doll (go ahead, check the website) and 3hive’s good friend Dave used to go by that exact same nickname. Also, The Locals totally have this tight ’80s kind of thing going on, and I just love that sound. Therefore, I’m happy to offer up their hard work for free and legal download. 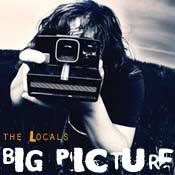 And to congratulate the band on the recent release of Big Picture, their new album. And to say, to any reader who made it this far, “Tidal Wave” is pop beauty, catchy and hook-filled and summery and fun. “Big Picture” and “Perfect World” are more calm, more retrospective, but with nice heavy guitars and big drums. And The Locals rock, straight up.